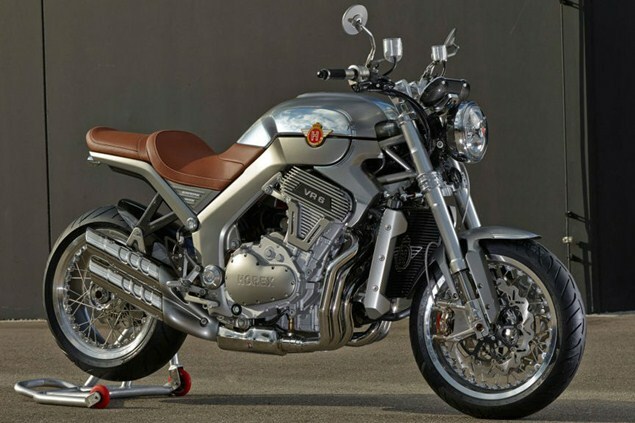 THE radical Horex VR6 has been relaunched at this week’s Frankfurt Motor Show with a revised look and tweaked specifications as the firm’s revival under new ownership starts in earnest. The ambitious project has been underway for several years but appeared to be closing for good last December before it was bought up in February by 3C Carbon Group. Designs for the reworked VR6 appeared in June and now we’re finally getting to see the finished product. In terms of engineering, the bike’s power is now up to 170bhp, with 138Nm of torque, and the suspension is all top-spec Öhlins kit, with the usual Brembo brakes. Dry, the bike weighs in at 221kg. In terms of tech, there’s an LCD instrument panel and LED headlights, while the seat subframe is carbon fibre. Initially the firm plans to make just 33 limited-edition versions, as seen here, and plans beyond that aren’t clear. No price has been announced, but all indications are that the machines will cost substantially more than the €22,500 of the previous VR6.